In 1842 Richard Owen recognised that the three hitherto discovered species - Iguanodon, Megalosaurus and Hylaeosaurus - shared certain similarities in their vertebrate structure. He therefore grouped them as a sub-order in the Saurian order, and called them Dinosauria ('Terrible Lizards'). In 1853 the sculptor Benjamin Waterhouse Hawkins was commissioned to construct full size concrete replicas of the prehistoric reptiles known at the time. 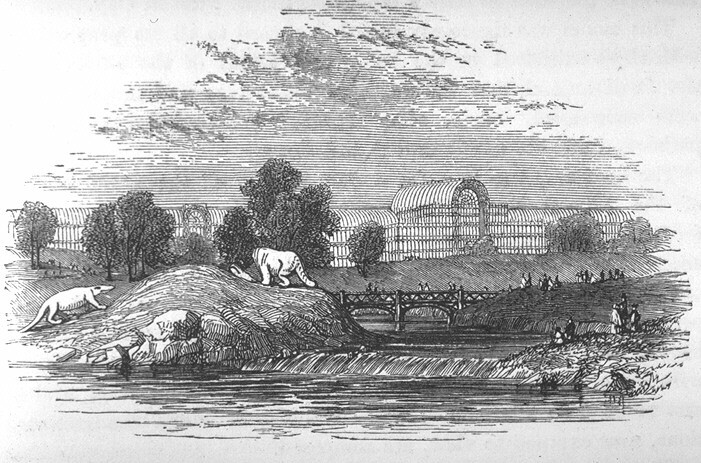 The restorations were installed in the grounds of Sydenham Park, following the Great Exhibition of 1851. In May 1854 Hawkins gave a paper to the Society of Arts which included some of his drawings of his restorations in their full settings. This drawing, together with Hawkins representations of the creatures in concrete, would determine how these creatures were to be depicted for the next 25 years. Owen was fully in agreement with Hawkins view of how these creatures must have appeared in real life. 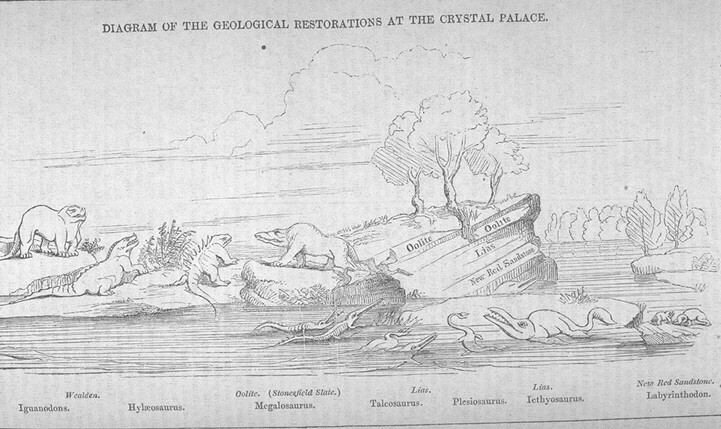 Owen published a small picture (above) of the restorations as a frontispiece to a publication in 1854.